Scarce map of Canada and the Great Lakes on the Eve of the French and Indian War. Carta Geografica Del Canada Nell' America Settentrionale. An attractive 1740 map of Canada and the Great lakes by Giambattista Albrizzi. This map offers an exceptional overview of French America on the eve of the French and Indian War. Based upon a 1708 revision of a 1703 map by Guillaume Delisle, this map covers from Baffin Bay to the latitudes of St. Louis (St. Luigi) and the Chesapeake Bay and from the lands of the Moozemblek to Newfoundland, including all five of the Great Lakes. The five Great Lakes are rendered on the model laid down by Vincenzo Coronelli in 1694. Coronelli's mapping of the Great Lakes was remarkable and would remain the finest mapping of the region until Bellin's in some ways inferior 1744 remapping. One of this map's most striking feature is doubtless its presentation of the supposed discoveries of the Baron Louis Armand de Lahonton (1666-1715), mapped here on the Delisle model as a series of lakes and rivers extending west of the Mississippi and occupying those unexplored territories extending north of New Mexico. Albrizzi recognizes that much of what he depicted in this area was speculative, textually acknowledging this cartography as presumptive 'unless the Baron Lahontan has invented these things, which is hard to resolve he being the only person that has travel'd into these vast countries.' Lahonton himself was a French military officer commanding the fort of St. Joseph, near modern day Port Huron, Michigan. Abandoning his post to live and travel with local Chippewa tribes, Lahonton claims to have explored much of the Upper Mississippi Valley and even discovered a heretofore unknown river, which he dubbed the Longue River. This river he claims to have followed a good distance from its convergence with the Mississippi. Beyond the point where he himself traveled, Lahonton wrote of further lands along the river described by his American Indian guides. These include a great saline lake or sea at the base of a mountain range. This range, he reported, could be easily crossed, from which further rivers would lead to the mysterious lands of the Mozeemleck, and presumably the Pacific. Lahonton's work has been both dismissed as fancy and defended speculation by various scholars. Could Lahonton have been describing indigenous reports of the Great Salt Lake? Could this be a description of the Missouri and Columbia Rivers? What river was he actually on? Perhaps we will never know. What we do know is that on his return to Europe, Lahonton published an enormously popular book describing his travels. Lahonton's book inspired many important cartographers of his day, Senex, Moll, Delisle, Popple, Sanson, and Chatelain to name just a few, to include on their maps both the Longue River and the saline sea beyond. The concept of an inland river passage to the Pacific fired the imagination of the French and English, who were aggressively searching for just such a route. Unlike the Spanish, with easy access to the Pacific through the narrow isthmus of Mexico and the port of Acapulco, the French and English had no easy route by which to offer their furs and other commodities to the affluent markets of Asia. 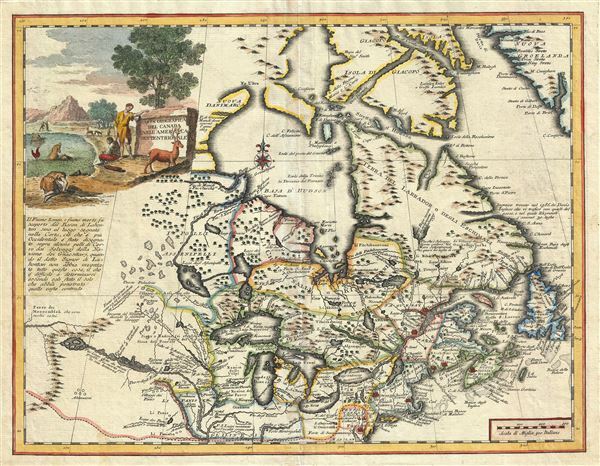 A passage such as Lahonton suggested was just what was needed and wishful thinking more than any factual exploration fuelled the inclusion of Lahonton's speculations on so many maps. Albrizzi's incorporation of a large decorative cartouche in the upper left quadrant is of special note. The graphic, which includes some sort of bizarre merbeast or lake monster (Champ anyone?) alongside stylized American Indians, was most likely drawn by the well-known Italian artist Giovanni Battista Piazetta (c. 1682 - 1754). Piazetta's graphic elements are in this case rather innovative in that they attempt to include both allegorical (monster) and descriptive elements. The transition to more descriptive cartouche work thus illustrated marks important advancement in 18th century Italian school cartographic publishing and set the stage for the later work of Antonio Zatta, among others. Kershaw, K. A., Early Printed Maps of Canada, Vol. II, entry 342, p.18. Hall, G. K., Catalogue of the National Map Collection, Public Archives of Canada, H12/900-, Vol. 10, p.338.